The last time I remember Bill Murray at Wrigley Field was a couple seasons ago when he threw out the first pitch at a regular season game. His pitch didn’t reach the catcher; nor did it stay in the playing field, it reached the crowd as he launched his pitch comically over the backstop netting for a souvenir. Could you expect anything less? Well, now that I think about it, he has enjoyed a golf cart or two overseas. The Tribune Company still has not come to an ownership agreement with final bidder Tom Ricketts regarding the Chicago Cubs and Wrigley Field because there is a shortage of cash somewhere in the deal. Instead of asking for more bank loans, or creating another big business story headline jumping on board, Ricketts took another road. He asked three diehard celebrity Cub fans to cash in on the deal, Bill Murray, John Cusack, and Jim Belushi – keep the Old Style flowing. Were you scared when Mark Cuban was rumored to be in the running? This better not be false or some way for Sam Zell to upset Cubs fans yet another time. Like he was actually going to allow Wrigley Field to be named something else. Think about these three class acts in the stadium with a longer list or reasons they want the Cubs to win. I just hope no gophers pop up on the field. 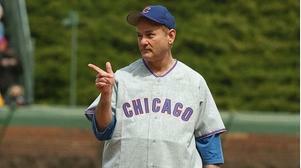 Ricketts could not have picked a better way to win over Wrigleyville. If you’re Cubs fan, you can’t tell me you haven’t dreamed of owning the ball club. I love it. How can I cash in? Mr. Ricketts are you listening? I can offer up no money, rather, a big heart and a solid addition the cast you are already reaching out to.